Ladies and gentlemen! Today, Bac Ninh Industrial Zones Authority celebrates its 20th anniversary and receives the First Class Labor Medal. On behalf of the Provincial Party Committee, the People's Council, the People's Committee, the Provincial Committee of Fatherland Front, I would like to send to you all delegates and staff members of the Bacinh Industrial ZonesAuthỏity greetings and good wishes best. Over the years, Bac Ninh has changed dramatically, from a poor and backward province, Bac Ninh has emerged as a rich province and a role model for socio-economic development. 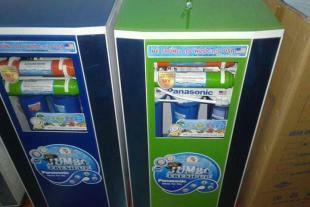 It is increasingly important for the development of the country, with many of the indicators in the top of the country. - The rapid growth rate, the average rate in the period 1997-2017 is over 15%, is one of the provinces with the highest growth rate in the country. - From agriculture to agriculture, only 2.9%, Bac Ninh has basically become an industrial province with an industrial production value of more than 1 trillion dong, export value reached 29.9 billion, ranked second in the country. - Bac Ninh has become a growth pole, a center of industrial development, affecting not only small scale industrial production, export and growth of the country (industrial production value is 12.2 %, the export value accounted for 14.9% of the total value of the country). Contributing to the outstanding achievements of the province is the special role of the Bacninh Industrial Zones Authority. The establishment of the Bacninh IZA 20 years ago, is a breakthrough step that shows the vision and thinking, to mobilize resources, attract investment, promote industrial development. The Bacninh IZA has advised the province on the mechanism and policies for the development of industrial parks in terms of quantity and quality, increased production capacity, accelerated the pace of industrial development, and made Bac Ninh a development center. industry of the country. - In 2000, we had the first industrial zone, so far there are 16 industrial zones, of which 10 industrial zones have been put into operation. 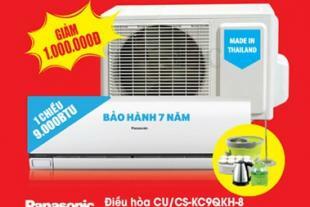 Of which, Yen Phong Industrial Park attracts the largest investment. 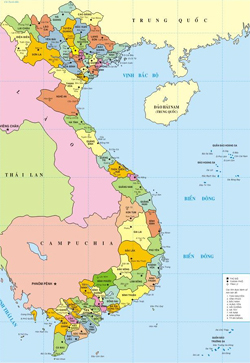 - Moving from thinking of attracting projects in terms of the quantity and scale to selectively attracting and focusing on high-tech domains, paying attention to investment efficiency (using less land, less manpower, but big value added), Bac Ninh becomes the center of development of electronic industry, mobile not only in the country but the whole region. - Industrial zones have become an important part of the economy, promoting economic restructuring, increasing production capacity, transferring technology, improving production efficiency, joining the value chain. accounting for over 70% of the industrial production value, over 90% of the export value, 51.7% of the provincial budget revenue. We can affirm, over the past 20 years, the management board of industrial parks have overcome difficulties and challenges; To step by step build and grow, consolidate and raise the efficiency and effectiveness of the state management in all domains, and to excellently complete the assigned tasks. 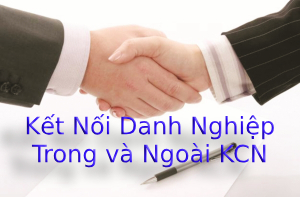 This is the result of the efforts, strive constantly, with the spirit of solidarity, initiative, creativity, dare to think, dare to do the collective leadership and all public servants, employees of the Bac Ninh Industrial Zones Authority. With the excellent achievements, Bac Ninh Industrial Zones Authority has received many honors and honors from the Party and State. In particular, today was honored to be awarded the President Labor Medal First Class. 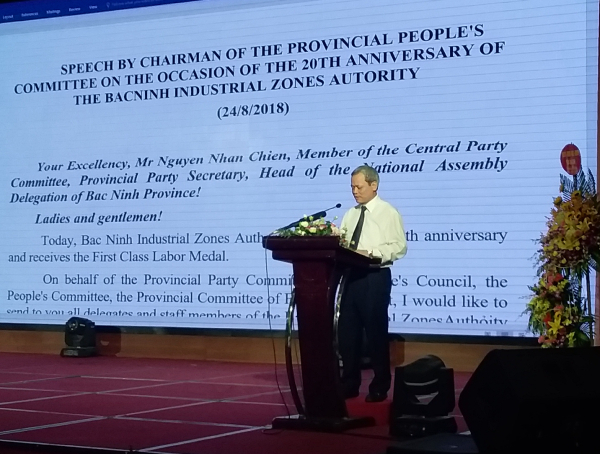 On behalf of the leaders of the province, I congratulate, acknowledge and warmly commend the efforts, important contributions and outstanding achievements of officials and employees of the Bac Ninh Industrial Zones Authority. Throughout the development and development of the past 20 years. At this formal ceremony, we would like to express our sincere thanks to the Ministry of Planning and Investment, its subordinate units and especially to the leaders of the Ministry for their care and support. The results are very proud. I hope that the comrades continue to pay more attention and love to Bac Ninh province. The Prime Minister expects Bac Ninh to become a symbol of Vietnam's rapid rise in the high-tech electronics industry in particular and the economy of innovation in general and soon to become a city. under the central. This is a very heavy task, requiring the party committees, authorities, people have to constantly efforts, striving, determined to implement. In particular, the management of industrial zones plays a very important role. The Board must clearly see its responsibility, focus on building its vision and orientation, renew itself, grasp the trend and advise the provincial People's Committee on the policy of development of industrial zones to meet the requirements of the development process. the provincial. 1. Adhering to the guidelines and lines of the Party, the laws and policies of the State, the Ministry of Planning and Investment and the province. 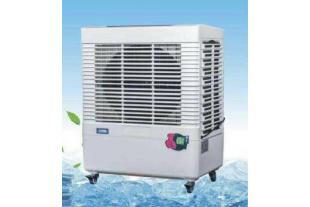 Ensure that the work must be in accordance with reality and in accordance with the law. 2. Drastically create and change in the administrative reform, simplify administrative procedures, shorten the settlement time, create favorable conditions for enterprises. The Board is a true reflection of the investment environment of the province, so the Board must be deeply aware and determine the responsibility for improving the investment environment. Have mechanisms for periodical dialogues, listen to the aspirations and recommendations of enterprises to timely handle, not waiting for businesses to solve problems. 3. To attract investment selectively, to ensure modern technology, to keep pace with the 4.0 revolution, to ensure principle 2 (many budgets, many added value), 2 (less land, less labor one body (environmentally friendly). 4. Studying and proposing mechanisms and policies for efficient management of industrial parks, enhancing investment attraction and assisting enterprises after investment. Actively coordinate with agencies and units to advise the provincial People's Committee on the promulgation of new coordination regulations suitable to the present situation, to create favorable conditions and meet the needs of enterprises in the industrial park. The Board signed a separate regulation on coordination with the electricity and water supply sector. 5. To focus on supporting investors to build industrial parks: Gia Binh, Vipip II, Yen Phong IIC and Hi-tech Park. At the same time, coordinate the Department of Construction and Planning Institute, architecture to plan these modern industrial parks, beautiful scenery (learning Vsip); note bus parking planning. 6. Strengthen inspection and supervision of the implementation of laws on planning, construction in industrial zones, especially violations of construction regulations, failing to ensure the regulations on fire protection (at present there are some workshops , extending into the corridor of the air). 7. Re-evaluate the effectiveness of 6 industrial park service projects; To study and propose concentrated development of practical and high-efficiency schemes. 8. Strengthen the link and promote the investment environment (The website is currently not available in English, Korean and poor. 9. Strengthening the Party building, building a clean and strong government authority, seriously implementing the resolutions of the Party Central Committee, reorganizing the assurance mechanism effectively, leading the Party in need of renewal. thinking, having a vision to catch up with the trend; To build up the contingent of cadres, civil servants, employees and laborers who have moral qualities, responsibility, proficiency and creativity to meet the increasing requirements in the situation. new. Promoting the spirit of solidarity, striving for emulation, striving to overcome challenges and successfully accomplished all assigned tasks. Construction and development of industrial zones become the model of the whole country. Inheriting and promoting achievement after 20 years; I have always hoped and believed that the Provincial Industrial Zones Authority would fulfill its assigned tasks excellently and make more and more contributions to the cause of industrialization and modernization. To build Bac Ninh into a centrally-run city by 2022; It is worth trusting the party committees and administrations at all levels. We wish you health, happiness and success.